Series devoted to saving treasured heirlooms from the scrapheap. Eric Knowles and his team visit Blenheim Palace where heirlooms include an Edwardian Tiffany cocktail tray. some of which we're restoring, and hopefully, making a bit of money as well. It's all here on Restoration Roadshow. the birthplace of prime minister Sir Winston Churchill. This majestic building, dating back to 1705, was an inspiration to Churchill throughout his life. He once famously said, "At Blenheim I took two very important decisions - to be born and to marry." There are hordes of people arriving here today with an amazing variety of heirlooms. Everyone's eager to put a value on them. -You may be going up to round about a £1,000. It would be lovely to do the work that needs to be done and make a wonderful clock. And just how much money will they fetch if they go to auction? Coming up - an Edwardian Tiffany tray with water damage. One slip of the knife could prove a very costly mistake. That is one very mucky picture. that spent far too many years in a stuffy old boardroom? And one not-so-careful owner needs expert help to save her grandmother's Mayfair tea service. Is this something that you broke recently, perhaps? Yes, unfortunately I did break them. and our restorers have their hands full, tending to the sick and needy. made by the famous American jewellery and silver company Tiffany & Co.
with silver gallery and handles, was a windfall to owner Len Wise. My mum tells the story that they bought quite a lot of furniture from a second-hand shop. And to clinch the deal the guy said, "Well, I'll throw this tray in." The next day he was knocking on their door saying, "I want that tray back, I shouldn't have given it to you." -But my mum said, "That was part of the deal." Well, it's the sort of tray that would have been made probably in around 1900, 1910. I think it's fair to say that these... If I can just lift it. and would have belonged to somebody of...considerable means. Have you given any thought whatsoever as to what it might be worth? Well, you're saying 100 and I'm a bit more optimistic. In its present state, not an awful lot more, maybe 150 or 180, but it does need some work doing on it. This tray has seen a bit too much of the good life. and those nasty watermarks need some expert attention. Tim Akers is like a furniture detective. at hunting out stunning original pieces for clients and then restoring them. But the question is, how on Earth is he going to get those pesky bubbles out? And will the cost of the work make Len feel in need of a good stiff drink? I think that's gorgeous. That's such a nice colour. Do you know what the wood is? -I don't, I've no idea. You've got some really lovely grain on that. You've got some inlay with holly with a line around the edge. You've got quite a lot of peaking where the damp has gone beneath the veneer and released the glue. ..you can hear the difference where it's loose. There's quite a lot of lifting throughout the tray. and re-glue it down with traditional glue. Then polish it up gently and it'll look absolutely fantastic. -Oh, you need a price. Yes, I was going to say, it all sounds wonderful, but at a price. -Well, I would say £100, maybe 120. Between those two figures, you'll get a tray that looks absolutely fantastic. It is reasonable, isn't it? -Yeah. Yeah, I'll go along with that. -OK. It's an offer you can't refuse. this is a £400 or £500 tray. I valued this tray in its present condition at around £150. Tim's hoping to get it back to its glory days for around £120. And I believe, in tip-top condition, this Tiffany tray could reach £400. The question is, what will Tim find when his patient goes under the knife? There's another small bubble there. I don't want to go any further than that. has experienced some less than genteel treatment. that makes the restorer's job a lot easier. and are saving items that many of you thought were beyond help. They really get interested when a patient with a fascinating local story to tell turns up. This 19th-century oil painting owned by David Newman, depicts a unique piece of local history. -Now, I believe you've brought along with this painting a little bit of old Oxfordshire. cos I can see dray horses and the barrels. We're talking beer, aren't we? That's right. We're talking of a local brewery in Oxford called Morrells, which has now gone. This painting was bought by my son-in-law off of an antiques dealer who bought it in an auction. It's been hung up on his wall in his lounge. -He thinks it's circa 1840. And it did hang in the chairman's office in the brewery apparently. Date-wise, I think you're bang on - round about 1840. You can normally detect from the type of costume that they're wearing. You've got almost like a stovepipe hat. There's a stovepipe hat you might have seen before on Isambard Kingdom Brunel. This painting was commissioned by the brewery's owner, James Morrell - the man with the impressive hat. The painter is unknown, but it's a wonderful scene and a valuable piece of local Oxfordshire history. -I don't know whether your son-in-law has got any plans to sell it. -Not as far as I know. All I would say is that with a picture like that, what am I going to pay for it in that condition? In that condition, it's somewhere between £1,000 and £2,000. -But that is one very mucky picture. It really is, isn't it? You've got a budget from your son-in-law to have this cleaned? -Yes, he's willing to spend £500. Sounds like a job for our paintings conservator, Lucia Scalisi. She's conserved everything from priceless Holbeins to Picassos. Cleaning up David's brewery scene will be a refreshing challenge. in that this is a painting that's in original condition. It's so rare for paintings nowadays to get through to this stage not having been tampered with. This painting is in dire need of a good clean. It certainly is. It would certainly benefit from at least a surface clean and a re-varnish. 17 decade's worth of dirt needs to be delicately removed by hand. The rosettes on the drey horse are a shade of brown ale, but should be bright red. The lettering on the cart looks smudged. And it's hard to make out any details on people's faces. For that, the price that you're looking at is maybe £300 to £400. We've the go-ahead to give it a clean. Once it's given the works, it's got to be then worth the best part of £5,000. -I'm sure he'd be pleased to hear that. -I would be if it was mine. So it's up to look Lucia to deliver the goods and revive this important piece of local history. In its current condition it's worth between £1,000 and £2,000. To give it a clean and a new varnish will cost £300 to £400. the painting will leap in value to £5,000. But this is a huge painting. There's a lot of canvas for Lucia to delicately clean. And with barrel loads of good old Oxfordshire grime to get rid of, she'll probably work up a thirst. You can see from the colour of the swab just how dirty it is. there's no shortage of antiques and collectables needing attention. as they work to revive these very special pieces. One team member is Roger Hawkins. He's a leading expert in ceramics restoration. from Egyptian antiquities to monumental mason vases. this Mayfair tea and coffee set has really gone to pieces. Were these something you inherited? Yes, they were my grandmother's, so I've had them about 20 years now. The surface of this break looks very clean so is this something that you broke recently, perhaps? -Unfortunately, they broke when I was moving house, but that was 10 years ago. Although you have kept them for a long time in this damaged condition, you haven't glued them. taking the glue off the surface before we glue it back together. These glues dry instantly, so if your mend is crooked, you're stuck with it. -Have you any idea of the value of these, what they would fetch? -To be honest, I don't, no. From my expert valuer's opinion, they would be around £40 to £60. or try and sell them like this, they would fetch practically nothing. it would probably cost about £40 to £60 anyway, simply because of the labour involved. Sadly, with all that damage, these Mayfair tea and coffee pots are worth absolutely nothing. For Roger to put them seamlessly back together again would cost £40 to £60. Which is what they'd make if they went to auction after restoration. What do you think of that? Is it something you would have done because of the sentimental value? I think I will, yes. I think the teapot and the coffee pot deserve to be restored. -And you would keep them, do you think? -I think I might do, actually. some of the pheasant design using a special airbrush. It is not a quick fix so Roger is going to retreat to his workshop. But can he work wonders on this much-loved heirloom and serve up a teatime treat for Maria? Meanwhile, the bubbled up Tiffany tray is raising all sorts of issues for Tim. and you lose the veneer, so we have to gently lift it. and we can work that right the way down. and then, we will work the same on the other four or five around the tray. Once that is done, we can polish it up and it will come up fantastically. It will be really good. where he has all the special tools to finish the job. inside Blenheim, the restoration challenges are on an altogether grander scale. is a never-ending task, costing millions of pounds each year. Well, it's a labour of love. and I realise what a wonderful property it is. not only for my family, but for the millions of visitors who have already been to Blenheim. and I hope will come to Blenheim in the future. Restoration very much involves the furniture here. which had been chipped and worn and generally deteriorated, completely restored and very fine they look. was given the palace after defeating the French. But as one priceless piece is restored, there's always another waiting to be worked on. as they walk from room to room because, really, we'll never finish restoring and conserving. It is just an ongoing task, really. he won the Battle Of Blenheim in one day, we are still fighting the battle for Blenheim today. by gently removing the dirt and grime from that Morrell Brewery painting. At the moment I am removing surface dirt and you can see from the colour of the swab, just how dirty it is. dipped in a chemical enzyme resembling human saliva. There's 170 years of grime engrained in this big three-foot canvas and it's not a process you can rush. It's not nicotine. If it was nicotine, we would have a lovely golden swab there. and it would be a lot more difficult to take off. This is years and years of accumulated dust and dirt from a domestic house. whether it is just removing dust and dirt from the surface or anything else. and they have ended up snagging on the paint and taking the paint off, really, and that is real damage. That ends up being quite expensive to repair. The level of surface dirt on here is quite extreme, probably several decades of dirt. It will look a lot better when this is off. and the contrast we are getting is really quite a nice thing, and encouraging, really. It's a satisfactory part of the job. and the restoration doesn't stop there. with a coat of protective varnish. But will we all raise a glass to her when she has finished? Coming up - will Tim's handiwork be just the tonic that the Tiffany tray needs? Removing those unsightly bubbles should give it back some fizz. But will it be enough to tempt those bidders when it comes up at auction? At the roadshow, we're discovering that some pieces are just not worth restoring. The repairs are too costly or too difficult. What would you like to show me? 'Shirley Arnold's claret jug is a case in point. The piece itself is German. or thereabouts, give or take 10 years. -The problem's there, isn't it? -That's where it is broken. because, any heat on it, next to this glass and it is going to break. -It is going to shatter. In its present state, it is worth £50. maybe £350 for a perfect one, but it ain't, I'm afraid. 'Sorry, Shirley, it's just too risky to restore. 'could smash it into smithereens. However, for the Tiffany tray, the advice was to restore and return it to its former grandeur. Tim's decamped to his workshop where he has specialist tools to work on this lovely piece. to glue the bubbles down and hopefully, get a seamless mend. over the years under this veneer bubble, you can see it all here. That will actually stop the veneer from going down level. You never quite know how something like this is going to go. Hopefully, it will knit back down very well together. but when you actually get some glue in there, that is a different story. Tim has heated up traditional glue and is using a syringe to painstakingly squeeze it into place. every single lift, lifting area. Just work down the other side now. And this is cooling all the time, so I've got to be quite quick. Really don't want the glue to get too cold. as well as the existing piece so this has to go right, I have no choice. so Tim carefully uses clamps to hold it in place and give the glue time to set. I think that'll be fine, but we will see. So, has our furniture restorer achieved what looked like the impossible? That has gone down so smoothly. These little grey areas will come off. Look, it is coming off with my finger. It is just from the paper. Yeah, I'm pretty chuffed with that, actually. That is a real result. and Tim will have to smooth the rest of the veneer before giving it a polish. Will he serve up a stunner? And just how well will it do at auction? Meanwhile, Roger Hawkins is in his workshop, getting to grips with the 1950s tea and coffee pots. He has already re-glued the finials in place, now comes the delicate task of making the breaks invisible. Now I have mixed my trusty filler, I am going to now start filling around this join. and also rubbing down the filler once it has hardened. It is a little awkward, because of the shape, particularly round the top here. there will be very little of it left. And then it is ready for painting. Let's hope Roger is able to match the colours and make the pots presentable again. It has been a great day here at our Blenheim roadshow and the restorers have done themselves proud. But I'm really keen to find out what David Newman thinks of Lucia's hard work. Will he be impressed? There is a difference, isn't there? has brought out its true colours and vibrancy. The once murky brown rosettes on the dray horses are now a lively red. and finally, you can see the detail on people's faces. where it is always easier to read the colours. And a lot of details have come through, like the rosettes on the horses and the details in the faces. And the nameplate has come up nice. The veil of dirt that was on there and acting like a smog has gone. So, you spent quite a few hours on that, then? Yes. I mean, the dirt was really black. Black, black, black dirt. It's lifting a cloud, really. Don't let anybody persuade you to do much more to it. -which is a great thing. -Smashing, thank you very much. 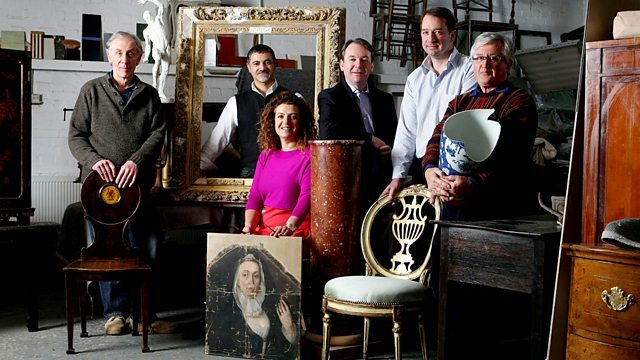 Here's a reminder of the battered bunch of antiques that came in for treatment at our Blenheim roadshow. remember those sentimentally valuable Mayfair tea and coffee pots that Maria wants to keep. and painting the broken finials to give them a second chance. But what will Maria make of Roger's skilful handiwork? Not seeing any joins anywhere. They are fabulous, actually. Before, their ceramic finials had broken off and the pots were destined for the bin. to create an invisible mend. I just can't see that there was a breakage there at all. Well worth having them done, definitely. They look as if they belong in an antiques shop, I think! It's great to have another happy customer. And we are about to see how Tim's Tiffany tray does at auction. It is sale day here at the Sworders Fine Art Auctioneers in Essex. The viewing room is crammed with potential bidders, all looking for that elusive bargain. but first, they need to be reunited with it. Let's do the business, shall we? And let's show you what appears to be a brand new Tiffany & Co tray. Goodness, that's lovely, isn't it? -That looks so nice now. He's made a great job, he really has. Before, this Tiffany tray looked like it had enjoyed one too many cocktails. Now it's got its star quality back. and the surface shines with quality and class again. running your finger over where the bubble was, but that has gone entirely. He's brought the colour up so nicely. Lovely. when we see this go under the hammer. Let's just hope we've got people out there with taste. but to my mind, £120 of restoration was money well spent. is worth every penny of £400 to the right bidder. you will have commission and charges to pay, so check with the auction house. Now, 1838 is the Tiffany & Co Edwardian mahogany oval tray. At 250, I start. At 250, I'll take 60 anywhere. 320. Come on, we want more than that. Explain that to me, will you? Because I don't understand it. -We will be quite happy to take it home. A bit disappointed that, you know, no-one in the room thought it was worth more than £320. But I'll take it home as a bargain at 320, thank you very much. I have to say, I'm not quite as philosophical as Len. In fact, I'm stunned. In my book, that wonderful tray with Tim's exquisite restoration was a dead cert at £400. tired and tatty antiques can become things of real beauty once again. and more items being saved and given that extra chance here on Restoration Roadshow. Eric Knowles and his hand picked team of talented restorers set up base at glorious Blenheim Palace. And it isn't long before a whole variety of needy items turn up, including an Edwardian Tiffany cocktail tray that's enjoyed a bit too much of the good life over the years. Can Tim Akers restore its spirits and make it fit for auction? Lucia Scalisi hopes to breathe new life into a 19th century painting that's spent far too many years cooped up in a stuffy old boardroom. And when an elegant Mayfair tea set that's experienced less than gentile treatment turns up, ceramics expert Roger Hawkins comes to the rescue. But will he be able to serve up a teatime treat?